Bright white glossy cabinets with dark matte black cabinets ... striking. SieMatic has expanded the choice available with its Pure collection, where the focus is on minimalism, with new matte finishes that help create trendy, elegant kitchens. Siematic, a premium kitchen brand from Germany, is setting new trends in kitchens with its elegant profiles and endless textural options from its Pure collection. With designers now juxtaposing mattes with shiny metals to create eye-catching contrast, SieMatic now offers the option for achieving this trend-forward and increasingly popular look with its Pure design theme. 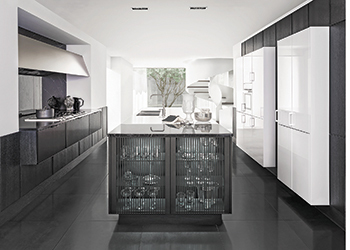 With combinations of materials that complement matte black fittings and fixtures as well as matte finishes and components for cabinets, Pure directly emulates and expands on the trend, says a spokesman for SieMatic. Harmony and reducing design to the essentials are the hallmarks of the Pure style collection. Characteristic of this style are room design concepts in which the functions of the kitchen are integrated perfectly and discreetly into the architecture. The elegant, minimalist language of form of the furniture elements emphasises the lasting quality of select materials and their precise workmanship down to the smallest detail. Pure minimalism is available with or without handles, and central to the aesthetic is a narrow 6.5-mm frame and glass slat doors, which create a modern vibe and can be specified in material combinations complementary to the black matte trend. For example, black metal doors with a matching edge alongside vertical slat doors in black metal offer a unique twist on the glass door trend, with items inside visible, but not on full display. Glass slat doors also come in gold bronze and nickel for an elegant metallic contrast to an all-black look. As a more striking alternative, designers can contrast Pure’s bright white glossy cabinets with dark matte black cabinets on opposing walls. A characteristic thin frame ties the looks together while maintaining a delicate profile. For consumers not ready to commit to black, SieMatic also has dark gray options that can achieve a similar, more subtle and less stark vibe. SieMatic has a long history and an international reputation for excellence in design, timeless elegance, and a high level of functionality. Worldwide, the brand is recognised for its premium-kitchens of first-class, outstanding design along with the highest quality of workmanship. The company’s constantly evolving reinterpretation of the modern kitchen is exemplified by the design principle behind its three style collections: Pure, Urban, and Classic. SieMatic products are marketed in the UAE by SieMatic UAE, which is registered with Mac Al Gurg, an entity that is part of the Easa Saleh Al Gurg Group. The company is currently supplying around 300 kitchen units from the Pure collection for the residential buildings at Al Barari in Dubai, UAE. This follows a successfully completed earlier order to fit 305 luxury villas within this property with kitchens representing two different styles, a classic and a contemporary one.